Book Consultation Now In your Dry Eye Treatment consultation, the optician combines with your eye health history and information about your work and lifestyle to assess the underlying cause of dry eye syndrome. Depending on the underlying cause, the optician has a range of treatment options available. Many people suffering from dry eye find that symptoms are alleviated through taking a dietary supplement, Lagad Lacrima, that contains essential fatty acids which promote the formation of the essential lubricant that keeps your eyes moist and healthy. If the underlying cause is inflammation of the eyelids, then the patented Eye Bag (a reusable warm compress) can be used to rapidly relieve the symptoms. The surface of your eye is always covered by a thin layer of liquid known as the tear film. When the eyes aren’t producing enough tears, or the tears evaporate too quickly, we are said to be suffering dry eye syndrome. Symptoms include sore, irritated eyes, blurred vision, the feeling of having something in your eye and the eyes becoming very watery. This is because the eye is dry so overproduces tears. However the tears don’t produce the right lubricants to counteract the symptoms of dry eye syndrome. They can also become red, but not always. About 20 per cent of people in the UK suffer from dry eye syndrome, rising to 50 per cent in those over 65. If the main problem is a blockage of the oil-secreting glands, then the condition is called Blepheritis. Blepharitis or meibomian gland dysfunction (MGD) is a common condition which affects many people with dry eye syndrome. 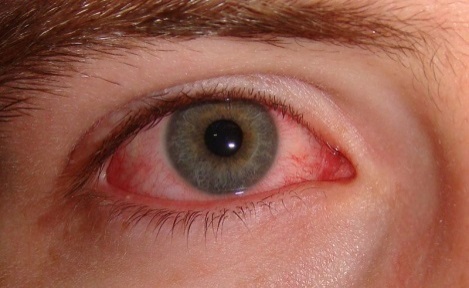 Dry eye syndrome can be aggravated by environmental triggers. You blink less when using a computer for extended periods of time producing less of the tears necessary to lubricate the eye. This can be aggravated by the dry air of the air conditioned office environment, a particular problem for those who wear contact lenses.